Neuron-specific PERK inactivation did not affect EAE initiation but impaired EAE resolution. 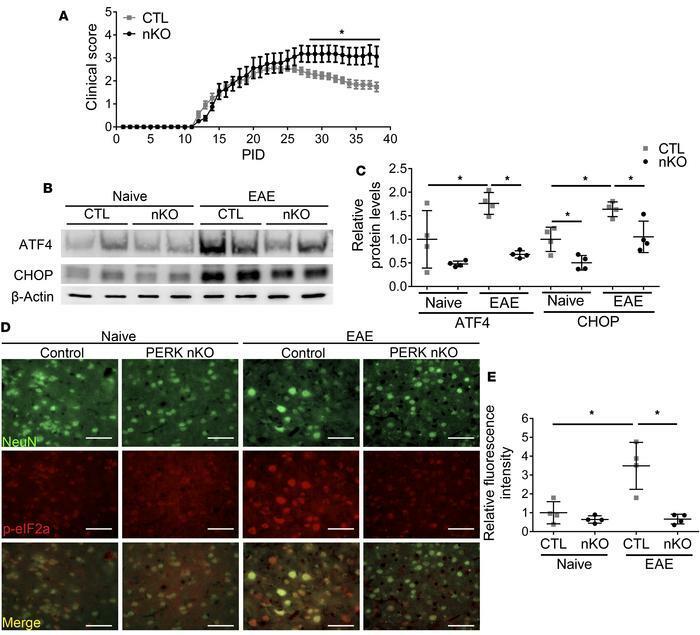 (A) PERK-nKO mice with EAE exhibited persistent, severe neurological deficits, without signs of recovery. n = 12 animals. Error bars represent SEM. Statistical analyses were done with a 2-tailed Mann Whitney test, *P < 0.05. (B and C) Western blot analysis shows that the levels of ATF4 and CHOP were significantly increased in the brains of control EAE mice at PID 22 compared with those in naive mice and that the levels of these proteins were significantly lower in the brains of PERK-nKO mice with EAE at PID 22. (D and E) NeuN and p-eIF2α double immunostaining shows that the level of p-eIF2α was markedly increased in neurons in the layer V of the primary motor cortices of control EAE mice at PID 22 compared with that in naive mice. Importantly, the p-eIF2α level in cortical neurons was noticeably reduced in PERK-nKO mice with EAE compared with that in control EAE mice at PID 22. Scale bars: 50 μm. n = 4 animals. Error bars represent SD. Statistical analyses were done with a 1-way ANOVA with a Tukey’s post test, *P < 0.05.